ADLINK Technology, a leading global provider of trusted machine vision products, today announced the release of its new NEON-1021-M Intel® Atom™ E3845 processor-based ready-to-go smart camera with MVTec MERLIC. Equipping its state-of-the-art quad-core smart camera with an easy-to-use machine vision software, the NEON-1021-M significantly increases competitive advantage, exceeding basic smart camera advantages for machine vision development. This unique solution will be featured at North America’s largest Automation trade fair, Automate, in Chicago from April 3-6. ADLINK and MVTec booths are located next to each other (#569 and #567) and will demonstrate how this uniquely integrated solution can meet your vision system needs and lower your total cost of ownership. Both companies will have plenty of experts on hand to answer all of your questions. ADLINK Technology is enabling the Internet of Things (IoT) with innovative embedded computing solutions for edge devices, intelligent gateways and cloud services. ADLINK's products are application-ready for industrial automation, communications, medical, defense, transportation, and infotainment industries. Our product range includes motherboards, blades, chassis, modules, and systems based on industry standard form factors, as well as an extensive line of test & measurement products, smart touch computers, displays and handhelds that support the global transition to always connected systems. Many products are Extreme Rugged™, supporting extended operating temperature ranges, and MIL-STD levels of shock and vibration. ADLINK is ISO-9001, ISO-14001, ISO-13485 and TL9000 certified and is publicly traded on the TAIEX Taiwan Stock Exchange (stock code: 6166). In addition to Taiwan, ADLINK has R&D and manufacturing facilities in San Jose, California; Shanghai, China; and Manheim Germany. An extensive network of worldwide sales and support offices are also available to meet the needs of our global customers. For more information on ADLINK, please visit http://www.adlinktech.com. MVTec Software GmbH is a leading manufacturer of standard software for machine vision. MVTec products are used in all demanding areas of imaging: Semi-conductor industry, web inspection, quality control and inspection applications in general, medicine, 3D vision, and surveillance. MVTec, with its head office in Munich (Germany), has more than 30 established distributors worldwide and in addition, MVTec, LLC works out of Boston, MA (USA). MVTec MERLIC is an all-in-one software product for quickly building machine vision applications without any need for programming. It is based on MVTec's extensive machine vision expertise and combines reliable, fast performance with ease of use. An image-centered user interface and intuitive interaction concepts like easyTouch provide an efficient workflow, which leads to time and cost savings. 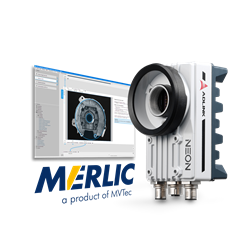 MERLIC provides powerful tools to design and build complete machine vision applications with a graphical user interface, integrated PLC communication, and image acquisition based on industry standards. All standard machine vision tools such as calibration, measuring, counting, checking, reading, as well as position determination are included in MERLIC. These are all based on the latest state-of-the-art machine vision technologies, such as matching or deep learning. Intel and Atom are the property of Intel Corporation in the U.S. and other countries. All other trademarks are the property of their respective owners.